Now that every one of the roughly 500,000,000,000 Tweets ever published will be searchable, we wanted to examine a representative sample of 1 million branded Tweets to see what they would look like, and how they engage Followers. 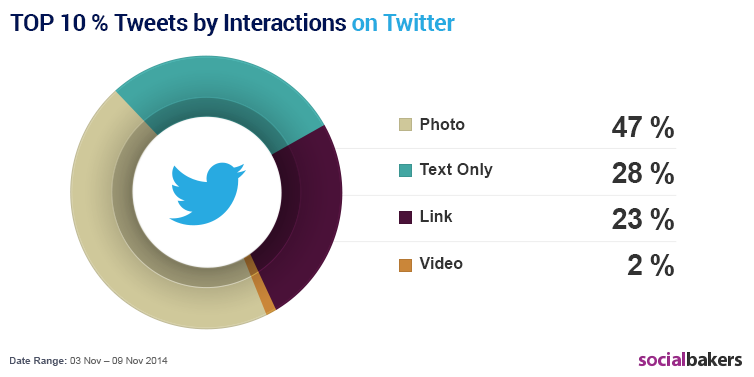 Our data, taken from November 3rd to November 9th, shows that, while Tweets with photos get almost half of all engagement, they are in the minority of published content. 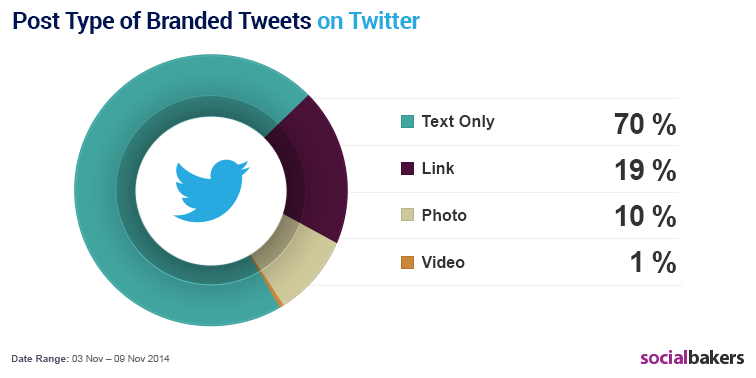 That’s right, only 10% of the more than 1 million branded Tweets we analyzed from last week included photos, even though they were by far the most engaging type of content. We looked at the top tier of Tweets in terms of Tweet Engagement. This sample size was dominated by photos. So why not increase the number of photos you’re publishing on Twitter? Because Twitter isn’t just a content network – it’s all about communication. Tweets with text only are the most common type for many reasons; just one great example is Social Customer Care. Twitter’s real-time communication potential is what makes it such a great platform for interaction and up-to-the-minute content discovery. The key is to take advantage of each aspect of Twitter’s capabilities – both as a starting point to boost shareability with engaging content, if you’re focusing on increasing brand or campaign awareness KPIs, and as a fantastic place for strengthening brand loyalty among fans with great customer service – because people are reaching out, but not many brands are answering. 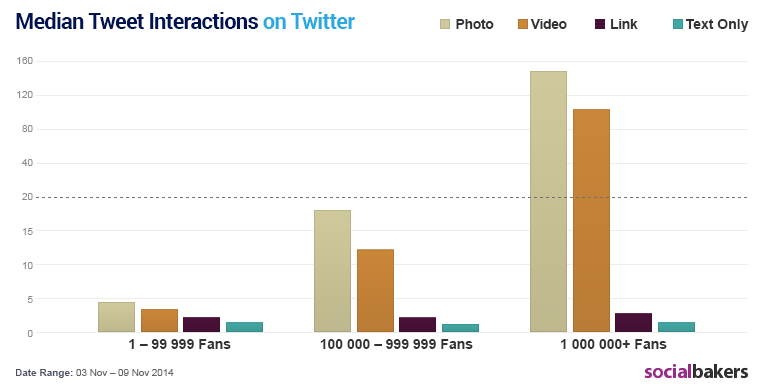 Building a large fan base certainly helps win increasing engagement – just look at the difference in median interactions for different page sizes. Want to dive deeper into your brand’s performance on Twitter? Try a trial run of Socialbakers Analytics free for two weeks! Twitter users are migrating to mobile. Are you ready? What Makes Car Brands So Cool In Social Media? At the beginning of the week, we released a graph showing that the automobile industry is the most engaging industry on Facebook for Q1 2012. Here are 5 tips to become as cool as car brands in social media!